I am decoupaging my father in laws old trunk into a toy box for the girls covered in your fabulous comic. I bought random selection of 17 on eBay from 1981 1982 and 1983. They arrived in the post today, to my complete surprise there was one from the exact day I was born!!! 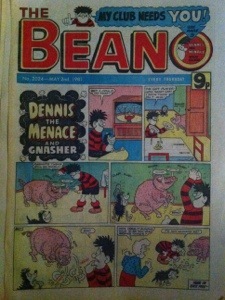 Given you were only produced once a week on a Thursday, then the odds of me getting a Beano out of the 17 I received from the exact date of my birth were slim (I had no idea I was born on a Thursday or the Beano was issued on a Thursday) and to get this treat on today of all days made a very hard day (first anniversary of my fathers death) a special day. I don’t really believe in ghosts but I’m comforted by pretending it’s a sign from Dad. Thankyou Birthday Beano. You shall occupy pride of place on my daughters’ new toy box. First Christmas without you. Mum and bro seem to be having fun chez. Curds. Mum keeps nicking all my Baileys that Bro bought me (since you can’t buy me my annual bottle anymore he has taken over the tradition). Bro is fine helping with dinner and girls adore him. Strange not to talk to you today. Miss you. Love you. Following on from writing to Delia about the traumatic time I tried to follow her boiled egg recipe , I am writing to you about the time I made your Baileys Tiramisu. I have a large bottle of Baileys in my fridge which my Dad got me for my Christmas present, a month later he died, so sadly this will be the last bottle of Baileys he ever got me. As it happens I am not that keen on Baileys but I used to be when I was 18, and every year since then my Dad or my brother bought me a bottle of Baileys as a Christmas present. I have never had the heart to tell them I don’t really like it, and since on Christmas day it is a bit nice in a coffee and its okay in an emergency “no wine in the house situation” so usually by the following Christmas I might just about finish the dregs of last years bottle so would be timely for next years bottle. Anyhow my mum came to stay this week and she suggested making a Bailey’s tiramisu to use the bottle up as I am not keen on drinking it these days. I happen to love tiramisu so I decide that is a genius idea. When I later nip to the supermarket for some essentials I remember the tiramisu plan but failed to bring the ingredients list with me, but a sneaky look at a packet of ready made Tiramisu in Sainsburys tells me I need cream, marscapone, and sponge fingers. I figure I have coffee at home and it will all be fine. Of course when I get home and look up your recipe here, I discover I am missing some of the crucial ingredients and don’t have the right amounts of anything. So I am going to share the LadyCurd version (my amendments are in purple) of your Baileys Tiramisu. Due to alcohol content serve small portion to unsuspecting friend @Glosswitch who has come for tea but needs to drive somewhere that evening as do you. Both have two spoonfuls and admit defeat as far to alcoholic to proceed and be able to drive safely. Put back in fridge for later. Get in later that evening and consume two bowls of IrishCream LadyCurd Tiramisu. Mouth goes numb and get quite drunk and fall asleep. 3pm next day ponder if Tiramisu is allowed as an afternoon snack but you probably shouldn’t as have to drive and pick up toddler from Nursery at 6 so write this letter instead all the while mouth watering at thought of tiramisu snack. 3.30pm finish post realise it needs a photo of the LadyCurd tiramisu so serve up a bowl for the noble purpose of adding photographic evidence to this letter and then eat it. 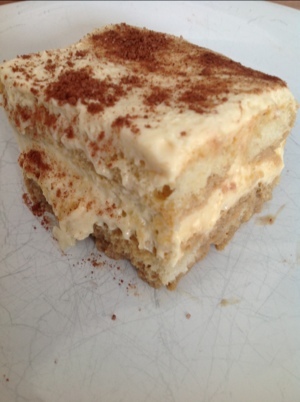 Eat Tiramisu- feel sick and a bit drunk but yummy and happy and now need to carry on with work, oops! So yeah absolutely fab recipe Nigella- with hindsight halving all the ingredients properly except for the alcohol was possibly a mistake [hic]. I think my version needs a touch more coffee flavouring and liquid to the sponge fingers so another espresso would have been ideal. But all in all I am very pleased with it- LordCurd doesn’t like Tiramisu and obviously the kids can’t have any so it’s a lovely indulgent desert for me to eat up swiftly in next couple of days. A very fitting tribute to my Dad’s last ever bottle of Baileys Christmas Present. P.S It has two raw eggs (and half all the other non alcoholic ingredients) in – how long do I have to eat it up if I made it on Tuesday Night? I am totally getting a massive teen girl crush on you which doesn’t befit my 30year old happily married mum with two kids status. Oh dear. The reason so many people don’t know this or use them is because rear facing carseats are rarer and can be more expensive. Forward Facing from 9months is the more dangerous “norm” in this country (In Scandinavia not so). When I found out about this I insisted Oddler went into a rear facing carseat from when she outgrew her stage 0 at about 10.5months. After doing some research we bought online the Britax Two Way Elite from the incredibly helpful InCare Safety Centre (We used the videos online to help make sure we installed it properly). It cost £200 so £100 more than what we were anticipating spending on a carseat but we had my parents buy it for Oddler’s christmas present and the fact it would last her until 4 (25kgs) and had the possibility of going forward facing if she got to an age she hated to be rear facing then we thought this was the best option for us (we also dont have Isofix in our car). Oddler is almost two and a half and she is totally happy being in a rear facing carseat even on long journeys. People often say “Oh but she can’t see what is going on” but that is rubbish- she has an entire unobstructed view out of the back window and can see out of the sides. 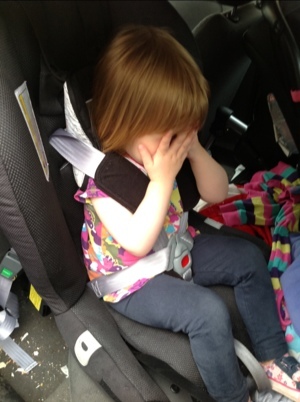 They often seem suprised my toddler is still rear facing like I am “babying” her. The safety facts I pass on soon shuts them up, although I do feel bad when it’s other parents who have forward facing carseats- I don’t want to make people feel bad about the carseat they chose (especially when so few people know abour rear facing safety) but more to educate people in the safest option and get the word out there. Yes there are very minor downsides to keeping her rearfacing- I can’t see what she is upto even if I turn around (not while driving!) but this is easily fixed by putting a mirror on the seat headrest in front of her so I can see out of my rearview mirror without turning around- so again that makes it safer than if she was forward facing as I would have to turn around for her. 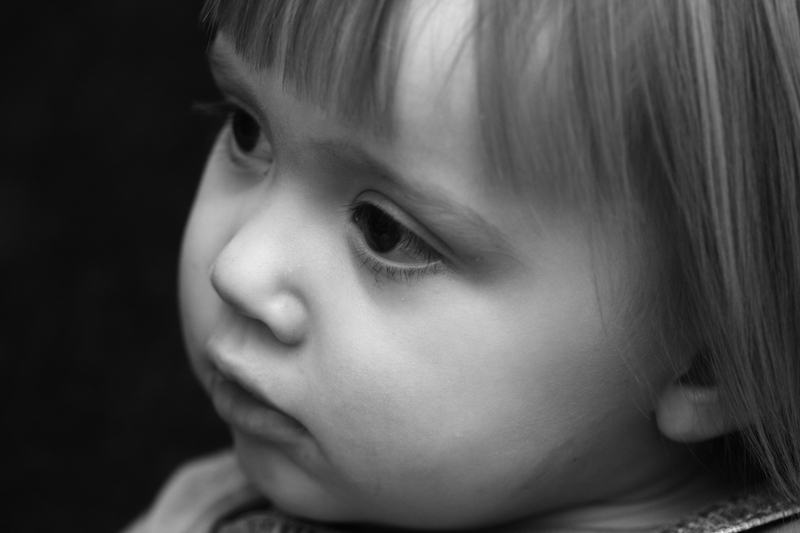 Also when she had a dummy to sleep for car journeys she would also often lose it down the side of the seat and we would have to stop to be able to rescue it for her but I think it would be similar if she was forward facing, she has got rid of the dummy now so it is no longer an issue. These are very minor niggles compared to the absolutely massive safety advantages. Plus it is easier to get her in and out of the carseat as you are putting her in the same way the car door opens, so no bracing yourself against the car door opened at its max to strap her in. A few months ago I thought Oddler was getting too big for her rearfacing seat and I was worried I was going to have to turn her forward facing, she is in the 99.9th Centile and the size of a hefty (NOT FAT!) three year old. I tweeted my worries and PHEW- the lovely @13Loki who has the same carseat told me there is a part of the base that folds out and when you do this suddenly there is a heck of a lot more leg room for them. 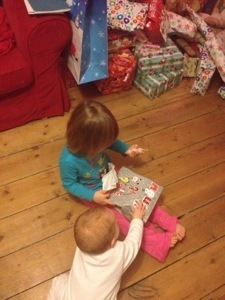 Hurrah- so Oddler is now safe in that carseat for another year at least. Annoyingly I have had my babies close together so in 6months or so we will need to buy another rear facing seat as Oddler won’t be ready to move up to the next stage car seat by the time Omble needs it, but never mind twill be a Christmas present from us all. It is so annoying these car seats are so expensive which is another reason for my post. The more consumer demand for these car seats there is, the more common these car seats are, the cheaper they will become. We need to demand more places stock them and they are much more affordable for all.